This is the Tarot deck that I designed. Published by Llewellyn Worldwide in 1991. Done in pen and ink with Prismacolor Pencil color. It took me ten years to finish if you count the time spent in research and designing. It's been out for quite a few years now, and I'm very pleased that a lot of folk have told me that it's not only lovely to look at - it works quite well for them, too. It's quite Pagan and nature oriented. Not harsh, but it will tell you to get off your seat and do something if that's called for. I used the Sword-Air, Wand-Fire correspondences, if you are aware of that controversy. If you want to see a few more cards before you make up your mind, I have 4 each from the Major and Minor Arcana posted, along with their meanings. 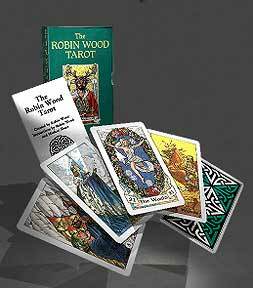 And, on a related site, I have a whole bunch of information about reading the Tarot. You can get the deck from Amazon.com or from your local bookstore. If you are going to buy it from Amazon, please use the link below. Thanks!